We’re mixing up the schedule for the PPRs a bit this year, doing corner infielders today so that we can run middle infielders together tomorrow, so the third base rankings follow on Eno’s first base post from this morning. If you’re not sure what all this is, read the series introduction. On to the corners who can field. 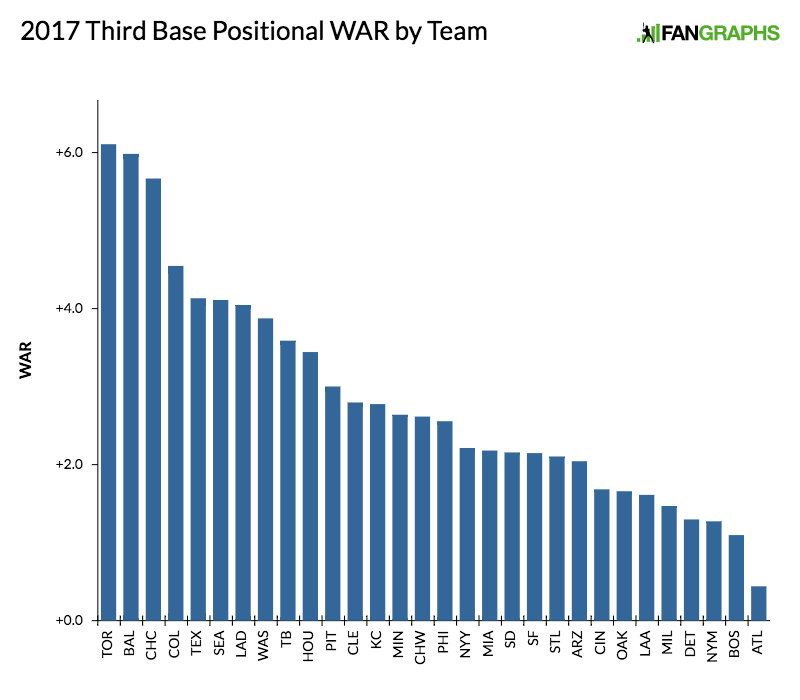 Third base is one of the deepest positions in the game right now. The top three players at the position all have arguments for being included in the best 10 or 15 position players in all of baseball, and the fourth guy probably has something to say about that, too. There’s a reigning MVP in this group, and there’re four others who could easily win the award, too (although it would help if Mike Trout turned into a pumpkin or something). This is an excellent group, and it’s only going to get younger and more interesting as time goes on. This may come as a shock, but Josh Donaldson is a really good player. He’s never posted a full season under 6 WAR, and we expect that to continue this year. Donaldson can pick it, he can hit it, and he’s one of the biggest advocates of everyone’s new favorite hitting philosophy. He’s got an MVP award under his belt, and we see no reason that he can’t compete at that level once again in 2017. As for his understudies, Barney and Goins are fairly similar players in that they can play all over the infield, and don’t really have a whole lot going on at the plate. You’re going to see a lot of these guys as we move down the list. For what it’s worth, you could make a reasonable case for any one of these first three or four starting third basemen as the best in baseball at the position, and you’d probably have a really good argument for it. We’ll go into detail with each one, of course, but once again: Josh Donaldson is a really good player. Close your eyes and imagine a third baseman making a crazy play to his right, way past the bag, and nailing the runner at first base. Who is that third baseman? Very likely, it’s Manny Machado. He’s firmly entrenched himself as a superstar. He can do pretty much everything anything, including stealing bags. His weird 20-steal 2015 season was followed by an even weirder 0-steal season in 2016. We’ve got him projected for seven steals this year, for what it’s worth. Buck Showalter will be happy no matter how many bags Machado swipes, though, because the dude can mash. He’s been roughly 30% better than league average on offense the past two seasons, and he’s combined that with elite defense. That’s how you turn into a franchise cornerstone. Ryan Flaherty is Ryan Flaherty. These rankings are, as mentioned earlier, based on our internal projections. That means they’re largely a “let’s assume everyone gets their usual amount of playing time” exercise. We have no reason to assume Kris Bryant won’t get a full season’s worth of plate appearances, and the same goes for Donaldson and Machado. But the Cubs move their players around defensively a little bit. Including Bryant. So here are the Cubs in third place. The Cubs have vastly superior depth. In the event that these three teams all lose their starters for a few months, the Cubs are in much better shape at the position than the other two. Who would you rather have filling in for that period of time: Barney, Flaherty, or Javier Baez? Ben Zobrist, who doesn’t appear in the above table, could also theoretically slot in there. The Cubs Triple-A option (Candelario) is also a better talent than than Goins, and whoever the Orioles will have playing there at Norfolk. The Cubs are going to be really damn good this year is the bottom line, as I’m sure the other power rankings will reveal. Nolan Arenado started walking a bit more last year. That’s not a huge deal by itself, but it’s yet another weapon for the player who does it all. The only reason that we’re not absolutely drooling over Arenado is because he plays at Coors Field, and therefore gets a bit of environmental help on his hitting. But a home run at Coors doesn’t count less on the scoreboard because it happened to come in Colorado, and Arenado is coming off two straight seasons of more than 40 bombs. Team USA may not have had Mike Trout, but they could have done a lot worse than having Arenado hit cleanup. He’s also really, really, really good on defense, too. Adames has a 42 wRC+ in 329 plate appearances. Ynoa has a 70 in 207 trips to the dish. So there’s that. Valaika has just 19 PAs to his name, but he’s never really hit at any stop through the minors. One guy to keep an eye on is Ryan McMahon, who at one point was a prospect of note and is still just 22 years old. But, yeah, the Rockies need Arenado to stay healthy if they’re going to do their whole madcap dash to a Rocktober sequel this year. All public data and information says that Adrian Beltre is about to turn 38, which is nuts. The dude just had a 6.1 WAR year in which he hit .300 and still contributed standout work at the hot corner. Beltre has already pretty much punched his ticket to the Hall of Fame, and we think he’s still going to be quite productive this year. Baseball players get fragile at 38, though, so it’s important to consider his backups. Profar actually figures to be the starting left fielder, so we may actually see the Rangers bypass the very light-hitting Alberto as the next man in line in the event of a long-term vacancy and go straight to Gallo. We’ve been waiting for Gallo to arrive on full-time basis for what seems like a millennium now, and we all know the score here. When he makes contact, it goes a country mile. That’s when he makes contact, though. Gallo is a three-true-outcomes guy through and through, and he could be a good one. He’s always been unlucky to be in the same organization as a legend at his position like Beltre. Either the Rangers really value him and have been cool with stashing him away for so long, or he’s lost his luster since he and Bryant launched mortar shells at Target Field in the Futures Game. We’re assuming that this chart is still accurate, and that Jerry Dipoto hasn’t traded away all the non-Kyle Seager players for other non-Kyle Seager players. Fingers crossed. Let’s make this clear: Seager is really good. He may not be as good as his brother, but almost nobody is. I’ve written previously on Seager being a consistent asset for the Mariners. He’s not the sort of player around whom you build your team, but Seattle would almost certainly be unable to contend without him. Seager just had his best defensive season ever by DRS, for what it’s worth. Valencia is primarily going to be splitting time with Dan Vogelbach at first base, but is more than capable of taking over for a little bit here. Third is the position at which we’ve seen him most often over the last few years, when he’s not otherwise occupied getting into brawls with Billy Butler. O’Malley is your standard-issue up-and-down utility player. Now this is depth. I assume we’re all finally used to the idea of Justin Turner being an above-average player at this point. The man can flat-out hit, and DRS thinks he’s useful with the glove, too. I’d like to think that WAR gives him credit for his beard, but alas. Los Angeles has an embarrassment of riches behind him, and all project to see time at various other positions, as well. Hernandez has been a good weapon against left-handed pitching, and Segedin is a pretty good first-man-through-the-breach-from-Triple-A kind of bat at the corners in the infield and outfield. Taylor is your prototypical utility infielder out of the Mariners organization. Take that as you will. Anthony Rendon is one of those players who might end up always leaving you wanting more. It’s a product of his pedigree and the 6.5 WAR onslaught he produced in 2014. Where’s the guy with the 130 wRC+ playing a premium infield position? He may not be coming back. But Rendon is still a solid productive player and shouldn’t be taken lightly. The projections still says he’s going to hit 20 bombs and play decently in the field, and like him for 10 steals, as well. Given the other toys in the Washington lineup, that’ll do very nicely. Quick, guess Evan Longoria’s age. Would you believe he’s only 31? It feels like Longo has been in the league for eons, serving as the face of the Rays through thick and very thin. This time last year, we were bemoaning the new normal for Longoria, a decent 20-homer guy who’s the best bat on a bad team. That was before the league-wide dinger fever infected him and he bopped 36 himers. We see him settling in somewhere in the middle, but all in all you’re still getting a good player here. Death, taxes, the Rays being caught between contention and the void, and Evan Longoria. Beckham is the unwitting poster child for Tampa’s recent draft futility. He’s finally stuck in the big leagues, and he’s serving as a plug-and-play guy for Kevin Cash. Don’t let his big spring fool you: he’s Tim Beckham. Robertson has lost a lot of his prospect sheen, and he now looks more like your favorite light-hitting utility infielder. The mid-2000s Yankees were a fun team. The best shortstop on the team played third base, and the guy who should have probably played third base was playing shortstop. I’m not trying to say that Bregman and Carlos Correa are going to be this generation’s Alex Rodriguez and Derek Jeter, of course. Both of those guys are Hall of Famers. But the fielding situation here is quite similar. Bregman is a stud on defense, and he can hit. He’s a natural shortstop and is only playing third because Correa is entrenched at short. Correa, though, is a large human being who may not be done putting on muscle, and if that comes to pass, he’ll profile better as a third baseman. We’ve all seen Correa bungle plays that should be easy. He’s not bad at short, but he’s not great either, and almost certainly not as good as Bregman. The projections clearly like Bregman here at third. The Astros will happily sign up for this level of production. Just don’t be surprised if these two have swapped positions next year, if they haven’t already done so by August. The other interesting man on the chart is Gurriel, who is currently looking like the everyday first baseman. He’s seen a lot of time at third in Cuba, however, and can play here in a pinch. Gurriel’s first full season is going to be fascinating, and you can read all about it in our first-base rankings. Jung-Ho Kang’s run-in with the law in Korea over the winter looms large here, as does his ongoing sexual-assault investigation in Pittsburgh. If he plays a full season, Kang will provide his usual mix of power and OBP. He’s a fine complementary middle-of-the-order player. If he doesn’t, for either injury or legal reasons, the Pirates have a proven remedy in Freese waiting in the wings. Freese signed an extension to remain in Pittsburgh and looks to split time between first and third in his current role, but wouldn’t burn the place down if he had to take over the everyday job. Jose Ramirez had himself a legitimate breakout season last year, and man, it was fun. He had a .355 wOBA! He stole 22 bases! He played all over the field! There’s not a lot to dislike about the manner in which Ramirez was nearly worth 5 WAR in his first big-league season. We’ve projected some regression, which shouldn’t come as a shock, but he should still be good. It should be noted that we’ve got him accruing another 0.7 WAR at other positions, by the way. Giovanny Urshela is a fine depth option. He’s almost all glove, but he’s damn good at that. Michael Martinez is a paragon of perseverance. Signed out of the Dominican Republic in 2005, he has a career 35 wRC+ and a -2.2 WAR. He’s almost certainly going to break camp with the big-league team. Bless him. This is going to be a very important year for Mike Moustakas, given that it’ll be his last before he hits free agency. After a great 2015 campaign, Moose was limited to just 27 games last season after a knee injury ended his campaign. The .187 ISO for which we’ve got him projected is right in line with 2015, but we’re tampering our expectations on his batted-ball luck. If he can outperform these projections, the Royals will be happy. If he performs to them, and the rest of the team looks as mediocre as it does, he may be wearing a new uniform come August. The next guy up, Cuthbert, performed at nearly replacement level during an extended replacement stint last season. Merrifield performed much better (1.7 WAR) while filling in at second base, but the official Royals depth chart currently has him as the starter at second base. Dozier is the interesting name here. He made the honorable mentions on Eric Longenhagen’s top-prospect list, and has long been on the radar in the minor-league player-evaluation community. It’s unlikely that he’ll see sustained plate appearances this year, unless Kansas City blows it up. If they do, though, keep an eye on him. Following a relatively unsuccessful expedition into right field, Miguel Sano is back at third base following Trevor Plouffe’s departure. Sano is there for his bat, of course, but he may not be a weakness in the field. You should know about his prodigious power by now. Sano’s a big dude and he hits big bombs. He doesn’t look like he’s going to be the super-elite bat scouts forecasted, at least not yet. It wouldn’t be a shock to see him take the next step, though. If that happens, look out. Escobar is coming off a -0.6 WAR season, so, yikes. We expect him to turn that negative into a plus, but don’t expect much more. He is firmly a bench player. The Toddfather (not the old one, but the new one) morphed into a full-on three-true-outcomes guy in his first season in Chicago, which resulted in him being just two points above league average on offense. He got his 40 bombs, but gone was the more relatively complete hitter we saw in Cincinnati. He’s still just 31, so it’s not like there couldn’t be an adjustment back. Our projections foresee some rebound in his batting average, but we’ve still got him down for a 101 wRC+. So, basically, yeah, we dunno. He’s probably going to be playing for someone else after the trade deadline. So who’s taking over? Saladino and Davidson will pick up some ABs here and there, and while Adonis lookalike Moncada could wind up being the starter there once he ascends to The Show full time, he’s much more likely to play second (we have him projected for 210 PAs there). Some people in the industry aren’t sure that Moncada is a second baseman long term (Eric is), so third could be his destination if the keystone doesn’t work out. If he sticks at second, Frazier’s long-term replacement may not be in the organization right now, unless you’re a Trey Michalczewski fan. The Sophomore Slump was real for Maikel Franco. He was probably never going to be a guy who hit for high average, but his OBP completely collapsed and his ISO withered. We’re seeing a bounce back for Franco, with his average up to .271, but his overall offensive game not reaching the 2015 heights. He’s still not a guy you’re going to want to see at the plate in a big spot with runners on if you’re a pitcher, but he’s not carrying a lineup, either. He did manage to step it up a bit on defense, but there’s still a decent chance that he’s the Phillies long-term first baseman, not third baseman. Howie Kendrick is going to be playing left field. I get to say that because he’s projected for 35 PA’s at this position. But let’s all just reflect for a moment on the fact that Howie Kendrick is going to be playing left field. Better times are right around the corner, Phillies fans. Hold tight. A monstrous stretch of bad luck turned Chase Headley into the most hated man in the Bronx besides Jacoby Ellsbury. It took Headley until his birthday, May 9th, to log an extra-base hit. He actually didn’t hit that poorly at all following the breaking of his slump, but it was enough to depress his line for the full season. Headley isn’t competing for MVP awards any more (boy, that was a weird season), but he can still swing the stick a bit and he’s a plus on defense. That’s just dandy for a team in transition like the Yankees. He’s a fine secondary piece, and he’ll hit you 14 homers while he’s at it. Works for me. Ronald Torreyes is a bite-sized utilityman, a true 25th man if there ever was one. Rob Refsnyder’s days in New York may be over, as he’s almost certainly not making the team and there’s no real spot for him at Triple-A or in the long run here, and he’s really not a third baseman at all. The Yankees have already said he’s available for those who may want him. Refsnyder will be a decent bench bat for whoever bites. The hype was never all that real. Once a sort of Zobrist 2.0, Prado is firmly entrenched at third these days. Currently nursing a hamstring strain sustained in Venezuela’s ill-fated run into the World Baseball Classic, Prado is likely to miss Opening Day while recuperating. That’ll lead to some time for Dietrich and Rojas, who are pretty much opposites of each other. Derek Dietrich is good for some hitting and having hot streaks that make you think he’s better than he is, and Miguel Rojas has the glove. He was the one who saved Clayton Kershaw’s no-hitter way back in the days of yore. Solarte turned himself into a useful player after making his debut with the Yankees at age 26. Traded to San Diego in the deal that put Headley in pinstripes, he’s pretty much been the starting third baseman ever since. His 2016 was easily his best season yet, putting up an impressive .286/.341/.467 line in 109 games. Naturally, we’re going to hedge our bets and predict some regression, but if the new Solarte was real, the Padres could have a pretty good trade chip. Ryan Schimpf is going to mostly be playing second, and Cory Spangenberg has the ceiling of a utilityman. It’s the Padres, you know? It’s going to be one of those years. If I told you before the start of the 2016 season that Eduardo Nunez was going to make the All-Star team and then be traded to the Giants to help with a playoff push, you’d have tried to sell me a bridge. But, well, here we are. What a time to be alive. In typical Giants fashion, they have approximately ten million players who can be plugged in all over the diamond. Don’t expect more heroics out of Conor Gillaspie. Expect Conor Gillaspie. Unless it’s October. Then expect heroics. This chart doesn’t include Korean league superstar Jae-Gyun Hwang. He mashed the snot out of the ball in the KBO, and while it’s no given that he’ll succeed here, he very well may seize the starting job at some point and push Nunez into a more suitable super-utility role. Peralta’s days of being a shortstop are long gone, so it’ll be up to him and Gyorko to man third base now that Carpenter is going to be the full-time first baseman. Peralta doesn’t have Gyorko’s pop, so how much he plays might depend on what Kolten Wong does at second base. If Wong holds down second base, Gyorko could easily cut into Peralta’s time at third, especially if the team wants more power in the line-up, but Peralta could retain a most-everyday job if Wong doesn’t show that he’s a regular on a winning team, which could push Gyorko to regular 2B duty. Jake Lamb can hit. We know that much. We also know that he managed just a 68 wRC+ against left-handed pitching in 2016. That’s not great by any stretch, but is somehow better than the 46 wRC+ he put up against LHPs in 2015. Unless he can figure out how to hit left-handers, Lamb is probably better served in a platoon role with Drury, who didn’t have much of a platoon split in his rookie year. Drury’s horrifying defensive metrics suggest that if he can be hidden as the small half of a platoon, it may be the best way to maximize his value in the league without a DH. Descalso cannot hit, no matter what his stint with Team Italy might have told you. It remains to be seen whether or not Lugo can reliably hit, as he’s got a very aggressive approach right now that could quite easily be exploited by big league arms, and he hasn’t been tested by Triple-A yet. The Diamondbacks system is not where you want to be looking if you’re in search of quality position player prospects. Suarez can hit the ball out if nothing else. He’s a low-risk, low-reward investment for the Reds, which is perfectly fine because this is a rebuilding year for them, and it’s an impressive outcome for a guy who was once a nearly faceless call-up for the Tigers to fill in for an injured Jose Iglesias. Peraza is the interesting one here, and he’ll be getting the lion’s share of his plate appearances elsewhere. These guys are just keeping the seat warm until Nick Senzel is ready at some point in the next year and a half. In typical A’s fashion, there’s a hodgepodge of players here. Ryon Healy burst onto the scene last year, but Trevor Plouffe’s arrival largely pushes him into a somewhat more suitable DH role. Plouffe is the ultimate placeholder, and the A’s are probably hoping that Matt Chapman could take the job at some point, if he gets his strikeouts under control. Having Plouffe around means they don’t have to rush him up, and can adjust mid-season if he proves ready. If you knew that Adam Rosales is on the A’s, and that this wasn’t a Rangers year for him, please collect your prize at the exit. Yunel Esocbar is gonna keep being Yunel Escobar. He’ll hit for average and get on base without striking out all that much, and that’s it. He’s a one-trick, one-tool pony. That’s better than whatever depth the Angels have here, since they don’t really have depth anywhere. It’s why they spent the winter bringing in competent players like Valbuena. The former Astro and Cub is going to be splitting time with C.J. Cron at first base, but has played lots of third and will see some time here. Theoretically, the Angels will develop a third baseman who’s better than a Quad-A depth guy. Until then, Escobar’s consistently decent bat will do, because this is the team with the greatest competitive advantage in the world playing center field. There’s a surprisingly good amount of depth here behind Travis Shaw. Shaw arrived over the winter from Boston in the Tyler Thornburg trade after struggling through a sophomore slump that dropped him to 13 points below league average on offense. Shaw’s got power whether or not he’s hitting for average and taking walks, and that’ll play in Milwaukee. He represents a good little buy-low option for the Brewers, who won’t be challenging anyone for a whole lot of anything this year. Jonathan Villar is going to be at second base following the ascension of Orlando Arcia, but he can play third in a pinch, and will likely do so on the days Shaw spells Eric Thames at first. There’s going to be a lot of moving parts in this infield. Hernan Perez is going to play all of the corners, and Yadiel Rivera is a fine up-and-down infielder. This position will be a lot more interesting next year, when Maurico Dubon and Isan Diaz are hopefully knocking on the door. The good news is that Nick Castellanos turned in his first above-replacement level season in 2016. He hit to a 119 wRC+ and batted in the middle of the lineup. That’s progress! The bad news is that Castellanos still can’t play defense, and that Victor Martinez is still employed by the Tigers, so Castellanos can’t DH. The names behind him on the depth chart aren’t particularly exciting either, so the Tigers are going to ride with Castellanos and cross their fingers that the bat stays a plus. He’s still just 25, of course, so it’s possible we haven’t yet seen the best of Castellanos’ capacity to mash. Detroit will need his best this year. It would be truly impressive if David Wright really does get those 210 plate appearances. He hasn’t surpassed 200 trips to the dish in two years, and has suffered setback after setback in his return from spinal stenosis. Wright was a great player in his heyday, but that ship may have passed beyond the horizon. Jose Reyes will take the brunt of the playing time here, and serve as the team’s leadoff hitter. That .312 OBP isn’t going to cut it in that role, though. If Reyes does indeed struggle like this, third base is going to be a position of worry all year. It wouldn’t be shocking in the least to see the Mets acquire Kelly Johnson at the deadline for the third straight year, because time is a flat circle. So, how much do you believe in a trimmer Pablo Sandoval? We’ve heard this story before, of course, but the Panda does indeed look svelte, and his bat speed looks good again. We’ve been down this road before. Sandoval will turn 31 this year. How many slim-downs does he have left in him? What’s a reasonable expectation for this version of Sandoval? If a tree falls in a forest and nobody hears it, can Pablo Sandoval hit again? There’s no way of knowing for sure. The nice thing is that Brock Holt doesn’t project to be appreciably worse, so at least the Red Sox won’t be in for a catastrophic drop-off if Sandoval is lousy again. Holt’s not great, of course, but the team should be an offensive force either way. If Sandoval hits, then this line-up could just be downright scary. Adonis Garcia is a relic of a bygone age, a 32-year old in his third season of big league play who can hit for average and launch some home runs, but doesn’t walk much and isn’t an asset on defense. Maybe ten or fifteen years ago, Garcia would have been viewed as a much more valuable asset. Now, he’s an afterthought. He’s precisely the sort of older player you’d expect to find on a team like the Braves that’s not quite ready just yet to contend. Rio Ruiz is an interesting prospect if nothing else, but not one who should be expected to make any major impact in the big leagues this year. Still just 22, he should have plenty of time to refine things at Triple-A Gwinnett, where the Braves hope he’ll find some power. We hoped you liked reading 2017 Positional Power Rankings: Third Base by Nicolas Stellini! Finally, he’s averaging 694 PAs over the last four years. In conclusion, I didn’t know what I was talking about and Josh Donaldson plays a lot of baseball. He was banged up a lot and 19 of his starts last year were at DH. He plays all out so it seems like he would hurt himself often, especially on those foul fly balls he loves going after. God, we miss him in Oakland. You might have confused him with Troy Tulowitzki. I’ve probably done it before.